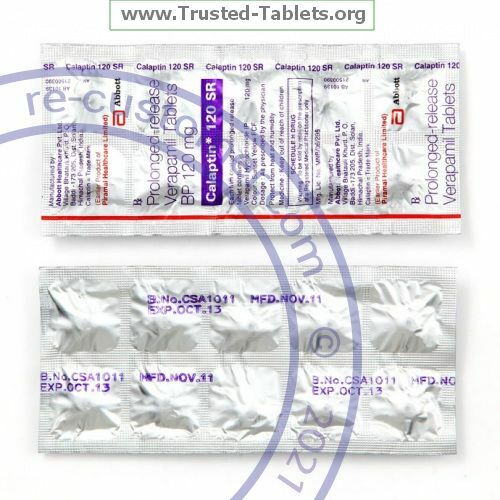 VERAPAMIL is a calcium-channel blocker. It affects the amount of calcium found in your heart and muscle cells. This relaxes your blood vessels, which can reduce the amount of work the heart has to do. This medicine is used to treat chest pain caused by angina, high blood pressure, and controls heart rate in certain conditions. Take this medicine by mouth with a glass of water. Do not crush or chew. Take this medicine with food to reduce stomach upset. Take your doses at regular intervals. Do not take your medicine more often then directed. Do not stop taking except on the advice of your doctor or health care professional. Store at room temperature between 15 and 25 ℃ (59 and 77 ℉). Protect from light and moisture. Keep container tightly closed.